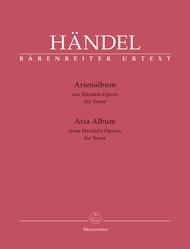 Aria Album from Handel's Operas for Tenor (Aria Album from Handels Operas (Tenor)). Composed by George Frideric Handel (1685-1759). Edited by Donald Burrows. For solo tenor voice/piano. This edition: Paperback, Urtext edition. Paperback. Piano reduction, Anthology. Language: Italian. 87 pages. Published by Baerenreiter Verlag (BA.BA10254).ISBN 9790006539338. With Language: Italian. 30 x 23 cm inches.